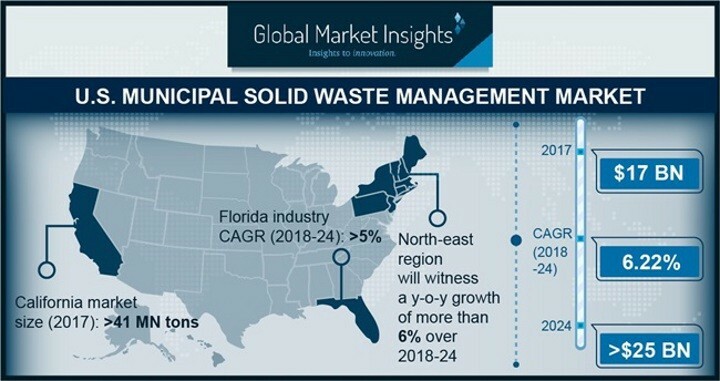 Ongoing adoption of optimized trash treatment techniques along with increasing environmental concerns will accelerate the U.S. MSW management market size. Increasing waste generation owing to large scale urbanization will further stimulate the industry growth. As of 2015, over 80% of the country's total population was residing in the urban areas which was previously 75% in 1990. The New York recycling and composting MSW management market is anticipated to exceed over USD 450 million by 2024. Government favorable norms to encourage sustainable trash management will complement the business outlook. The department of sanitation has availed comprehensive list for various recyclable materials and their detailed recycling information in their website along with their weekly pickup. Pennsylvania Municipal Solid Waste Management Market Size, By Service, 2017 & 2024 (Million Tons).